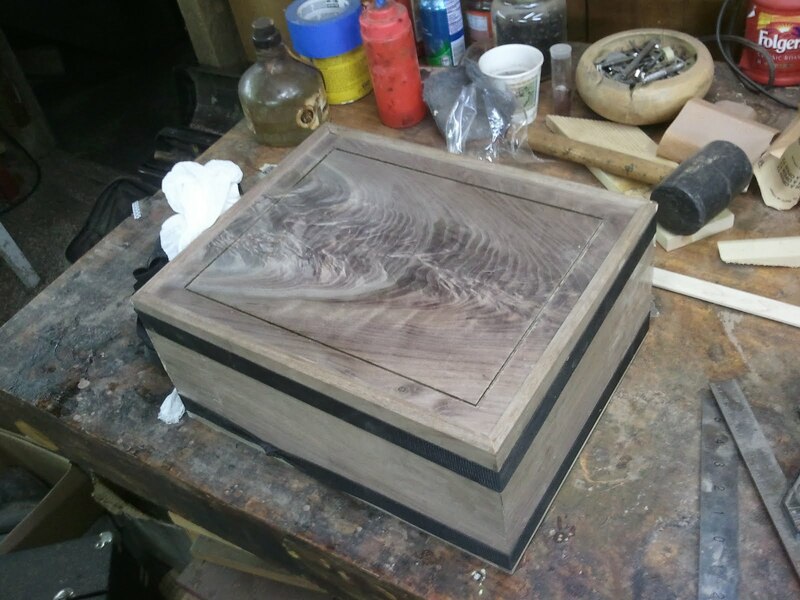 Earlier this year I was commissioned to make a jewelry box made from Walnut and Maple. 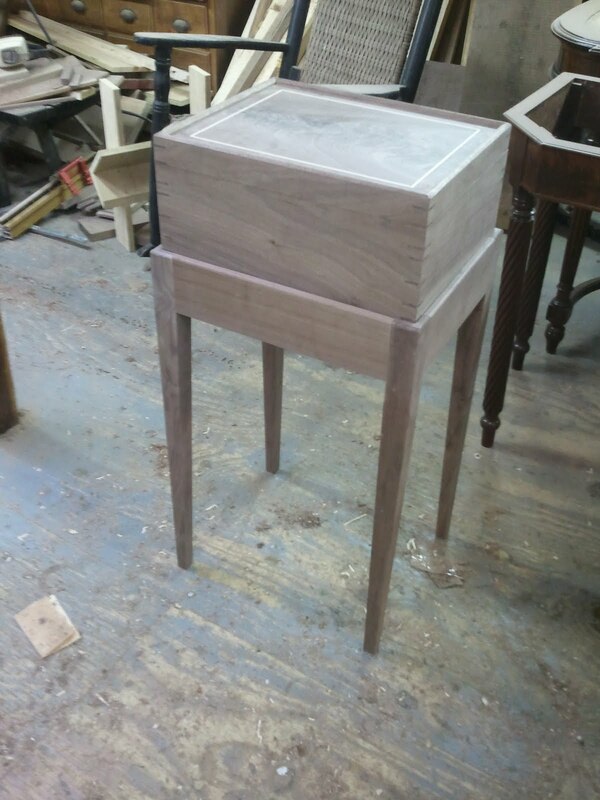 Because of the dimensions of the box (15"wide x 7"tall x 12" deep) the customer and I decided it would take up too much room on a dresser and that it would be nicer if it had its own stand. 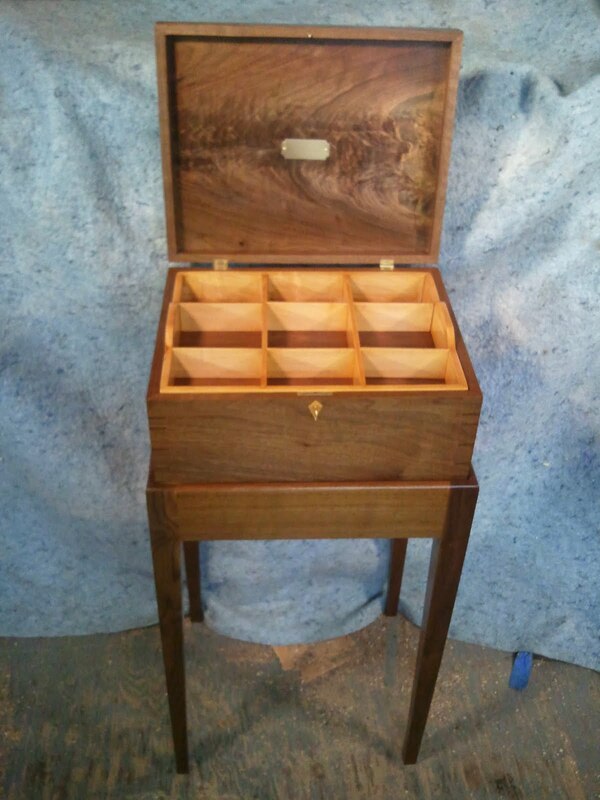 Taking inspiration from early 19th century southern celerettes (liquor bottle storage boxes) and sugar chests, I designed the jewelry box on stand. 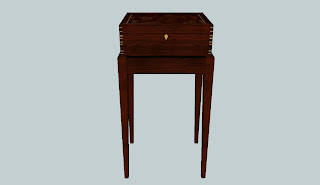 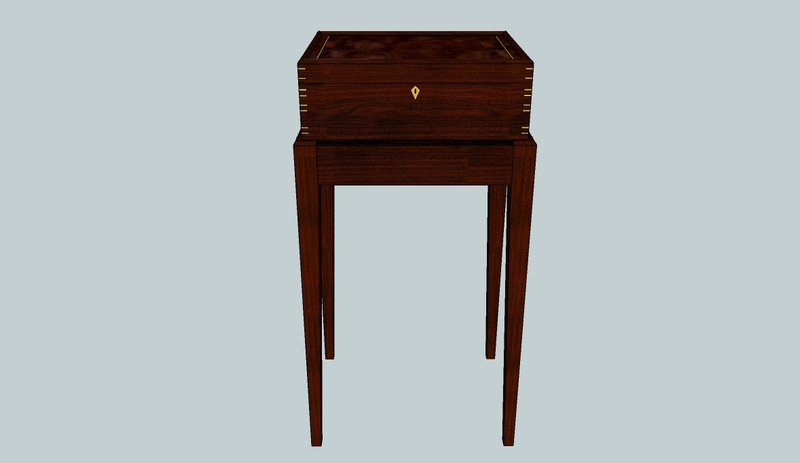 The designs were made using Google's Sketchup program which is the program I use to design all of my furniture. 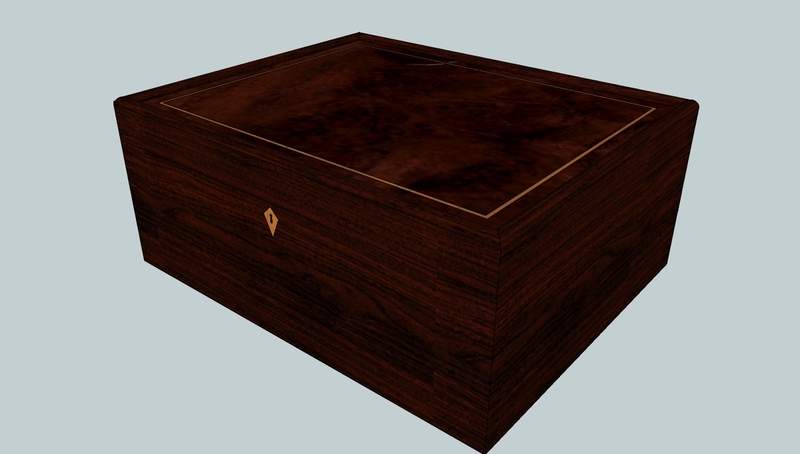 One benefit of using this program is that it allows me to orbit the 3d model and look at it from any angle. 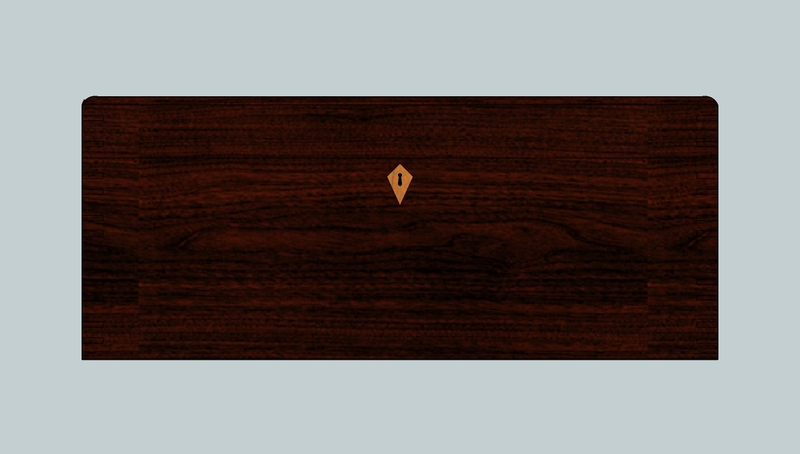 As a bonus, I can then take "snapshots" of the model in the program and export them as jpeg (picture) files. the three images below were captured from the sketchup program and show the model of the box on stand from the front, followed by two views of the jewelry box alone. 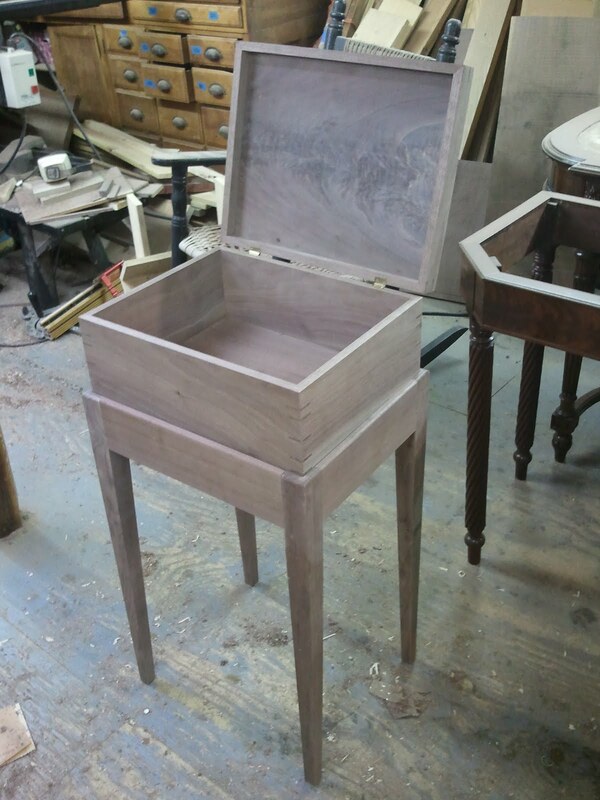 A few minor details were changed from the drawing to the finished product. The first is that the dimensions were changed from 6" tall in the model to 7". 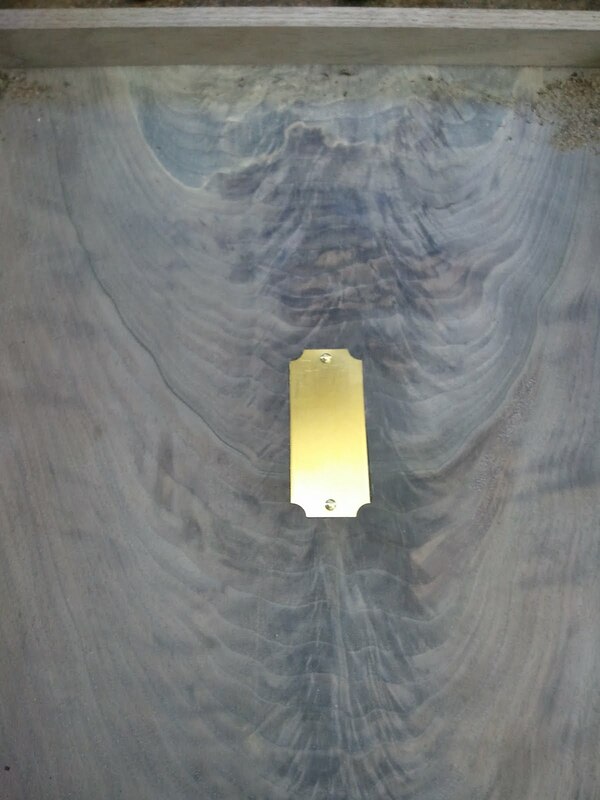 The second was that Walnut splines were chosen over Maple. 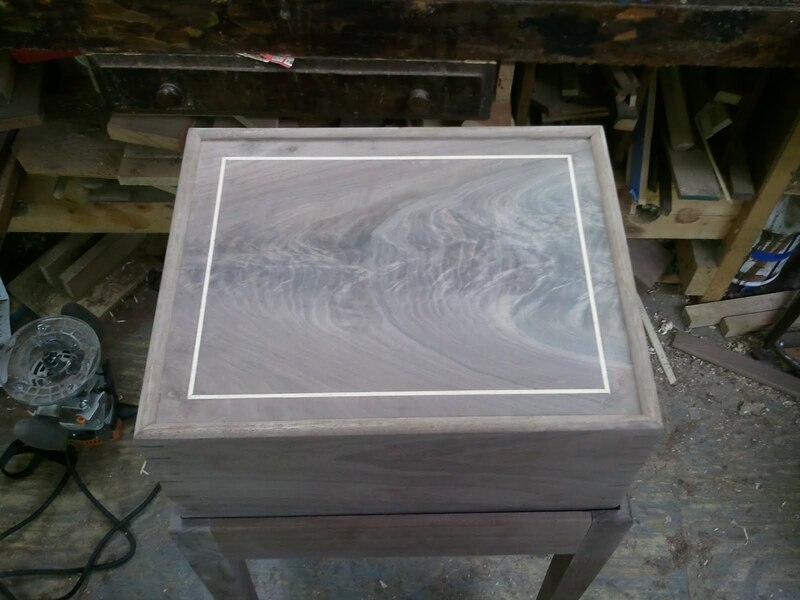 The third was that the brass plate mentioned in the previous post was moved from the top of the box to the inside of the top. 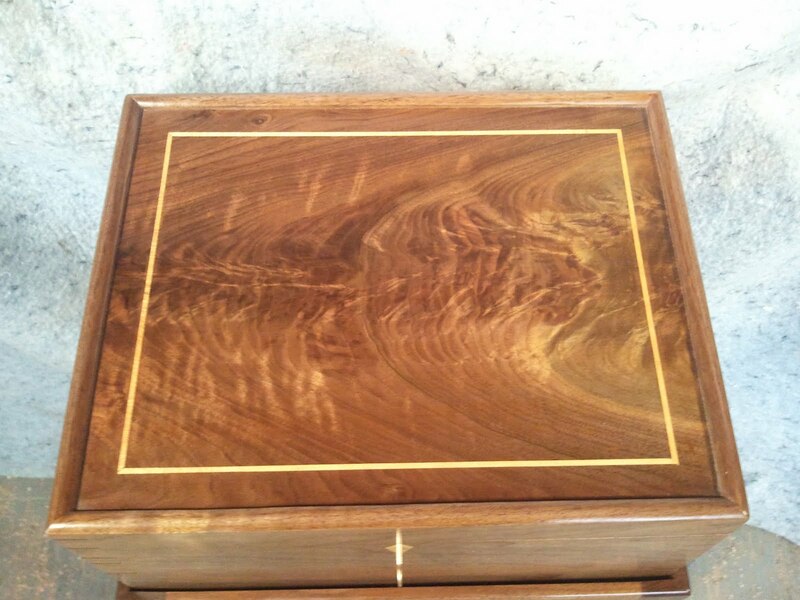 This is much more subtle and allows the flow of the top to be undisturbed. 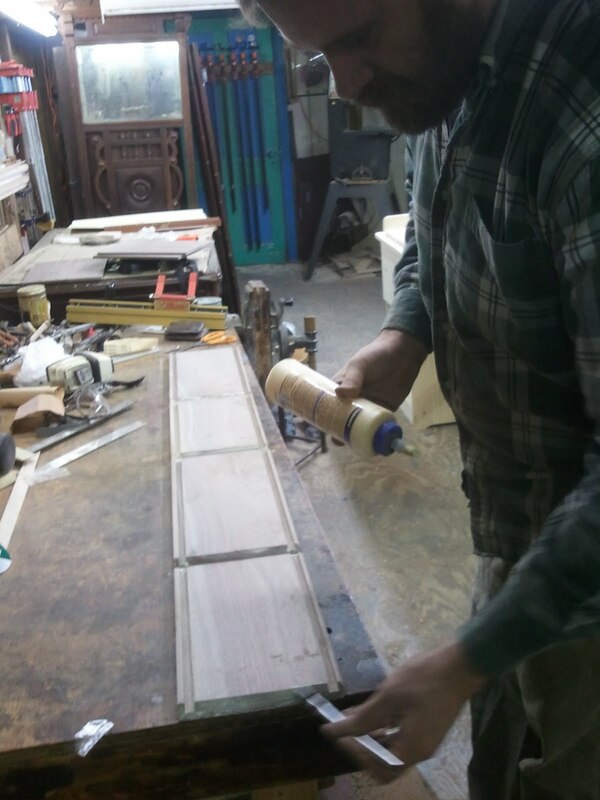 This project started out as all other building projects do, with the milling of the lumber. I found an exquisite piece of crotch Walnut to use for the top that came from a larger 1.5" thick board. 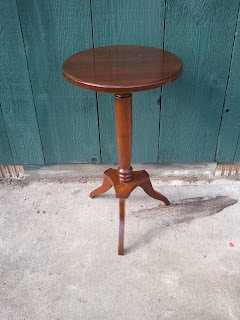 after re-sawing the board to get the piece I wanted, I used the rest of the board to make the legs for the stand. 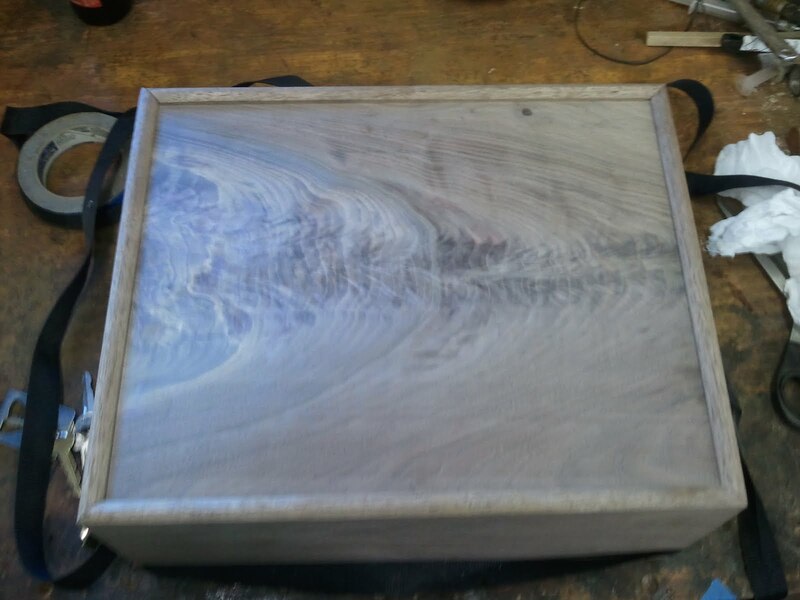 Below is a photo of the milled wood used for the sides of the box and the stand followed by a photo of the piece chosen for the top. 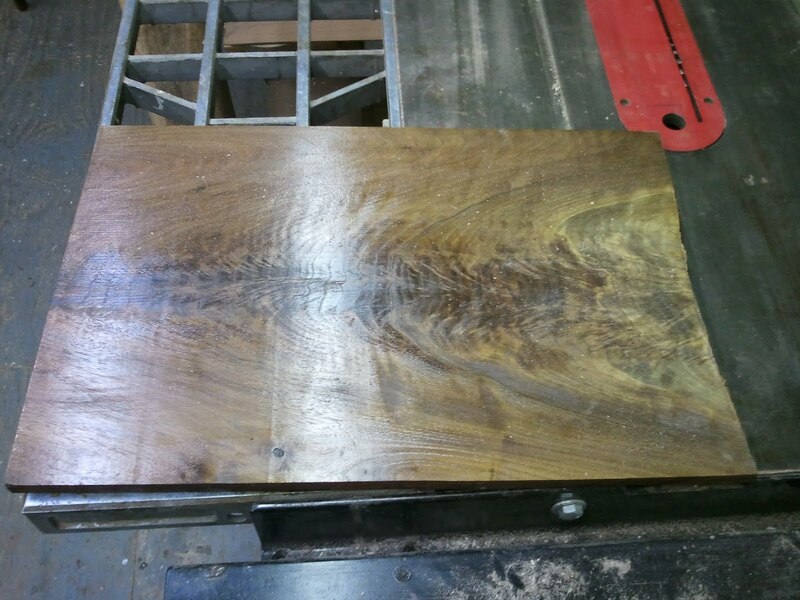 This piece was coated with shellac until I was ready to mill it to its final dimensions to help prevent the board from cupping and twisting, which crotch lumber is prone to do. The next step in the process was to cit the groves to accept the top and bottom of the box in the sides. 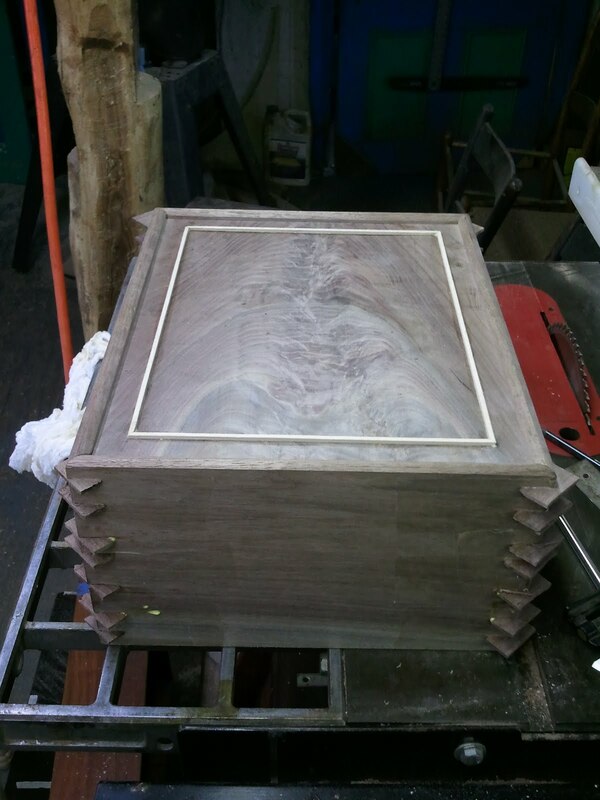 Each side and front (or back) was made from one piece of wood which was cut so the grain continued around the corner of the box. 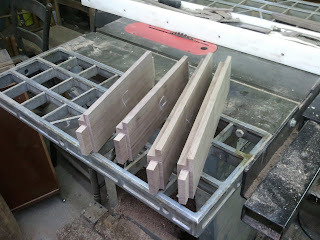 Here are the four sides cut with the top edge of each side molded. 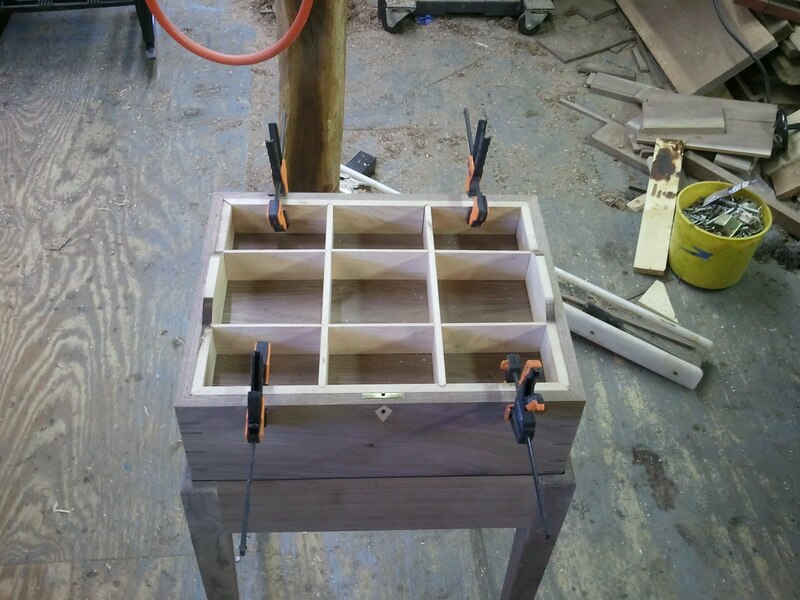 I still had a bit of work to do before these sides could be assembled. 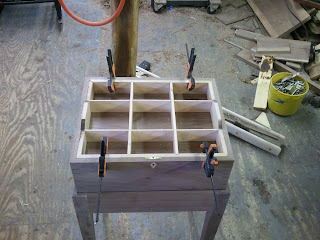 This shot shows the top fit into place. 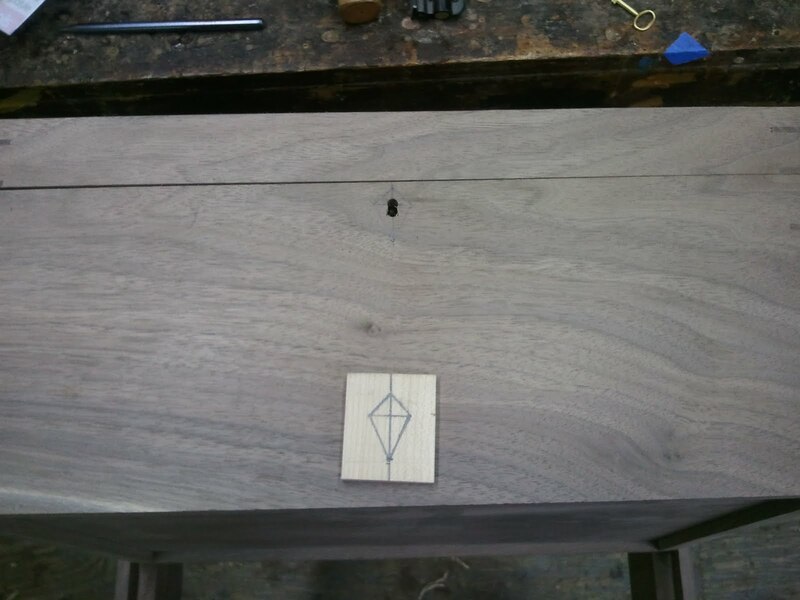 Before I glued the box up I had one last step, which was to route a channel in the top to accept a 1/8" band of Maple inlay. The finished channel can be seen in the following photo. This photo shows me assembling the box. The sides are taped together on the outside using packaging tape and the top and bottom of the box are inserted. 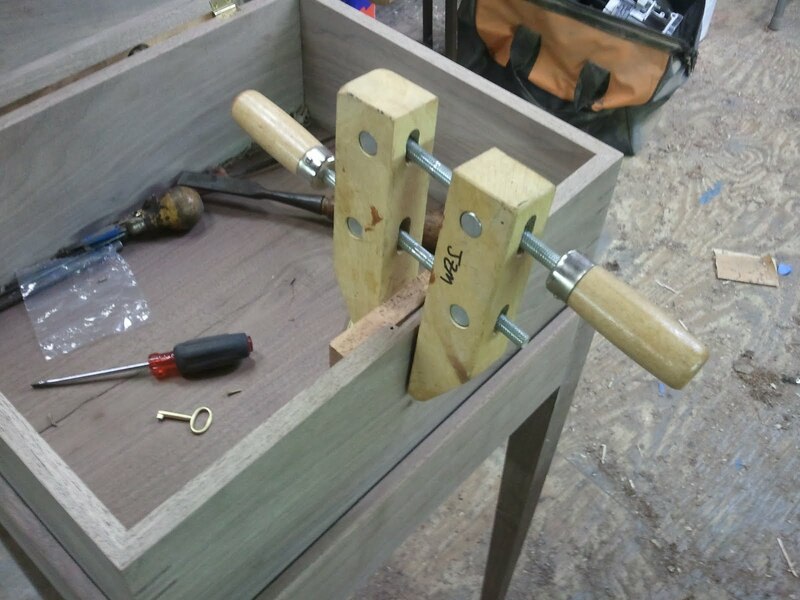 Once the sides are closed around the top and bottom, band clamps are used to square up the side and make sure the mitered sides are tight.The following photo shows the assembled box with the band clamps in place. 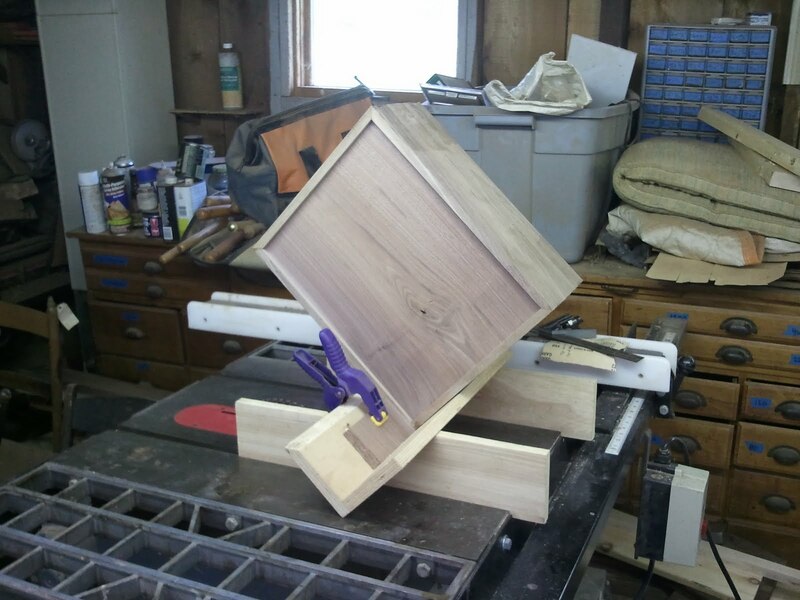 After the glue had dried, the box was set in a jig and passed over the table saw blade at a diagonal angle to cut the slots for the splines that hold the mitered corners together. The photo below shows that process. 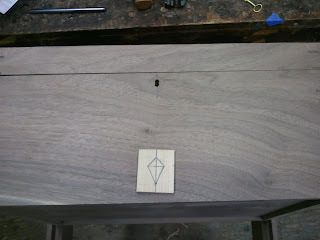 After all of the slots were cut out, Walnut splines were inserted into the slots with glue. 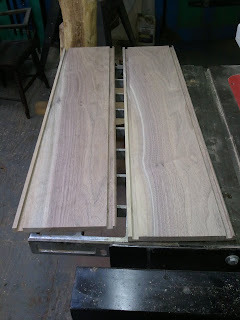 Once the glue dried I pared down the excess wood. 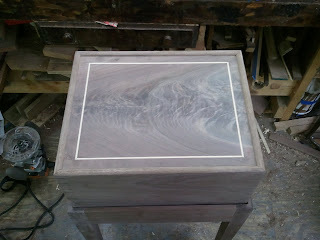 I also took this opportunity to inlay the Maple banding in the top. Again, this was pared flush after the glue had dried. 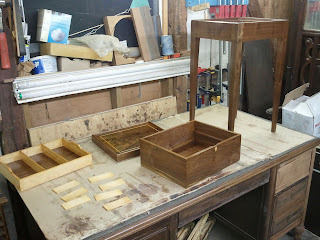 While the box was drying, I turned my attention to construction of the stand. 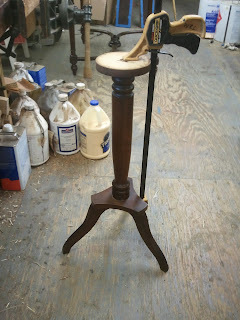 The first step in this process was to make apron for the stand. 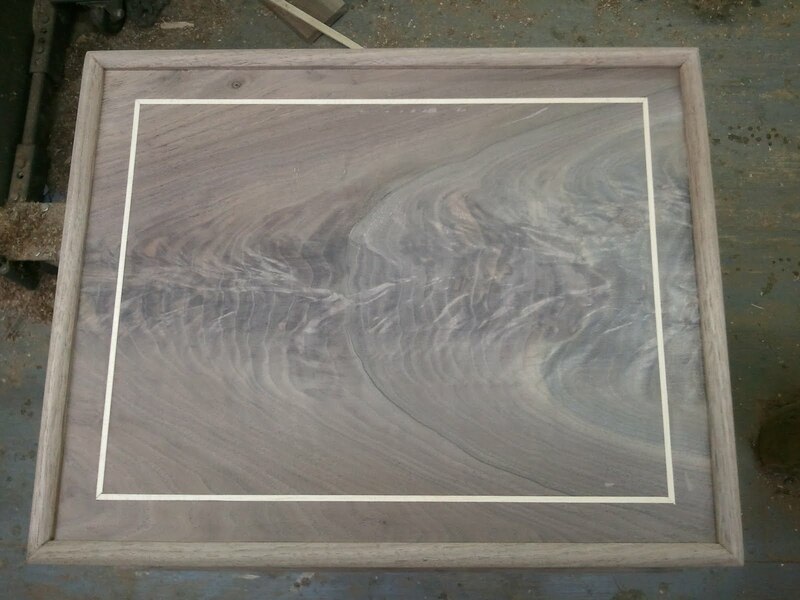 The individual pieces are labeled with chalk on the front sides to make it easier to see. 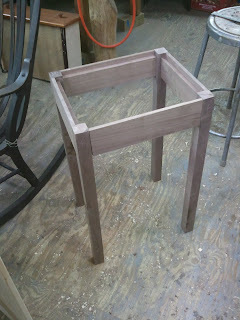 After the aprons were made, I morticed the legs to fit. 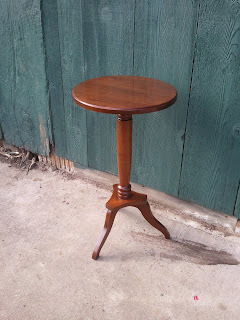 In the photo below, the stand is seen roughly assembled. 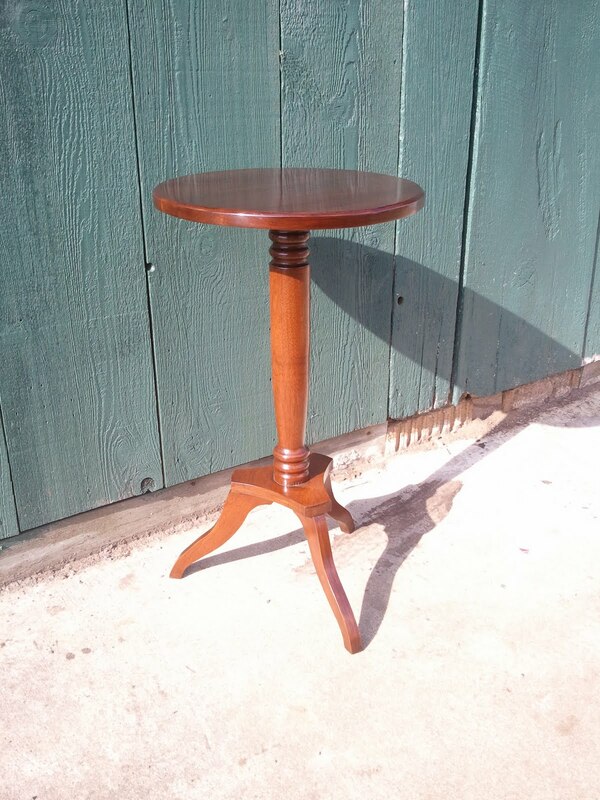 Once the joinery was completed, I tapered the legs and molded the top edge of the apron and legs for a smooth transition from the stand to the jewelry box. 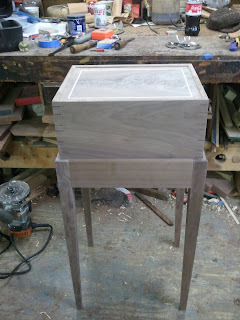 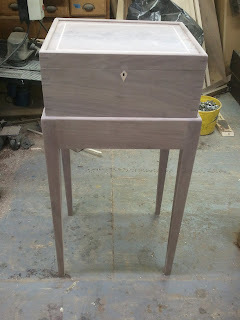 This photo shows the box assembled and inserted in the completed stand. 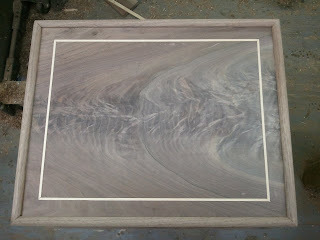 this photo shows the top with the maple banding pared down. 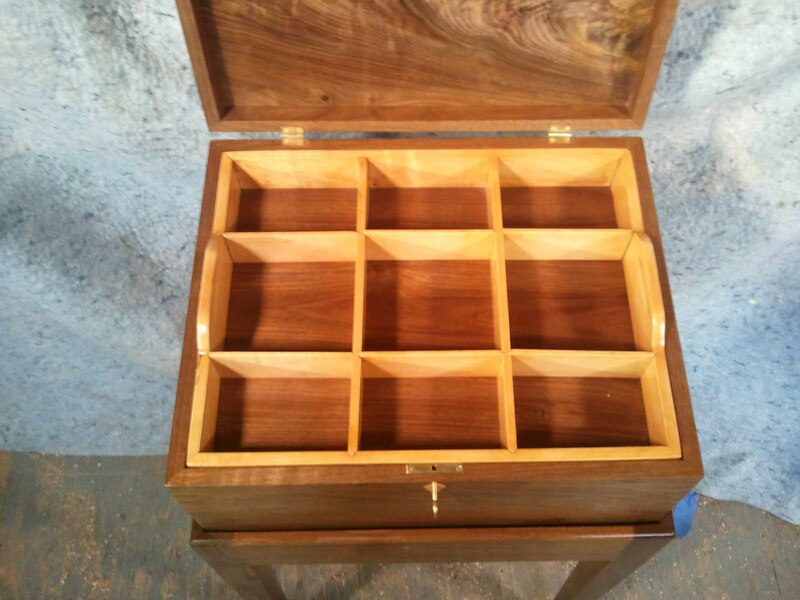 The next step was to separate the lid from the bottom of the jewelry box. this was done on the table saw. 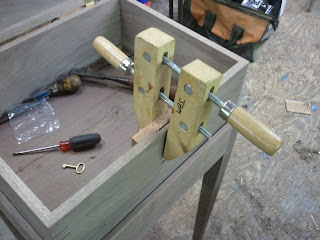 After that, the hinges were put in place. 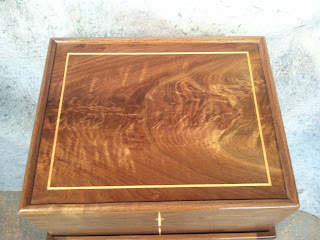 Special hinges that stopped at 95 degrees were used to ensure the lid did not open too much. 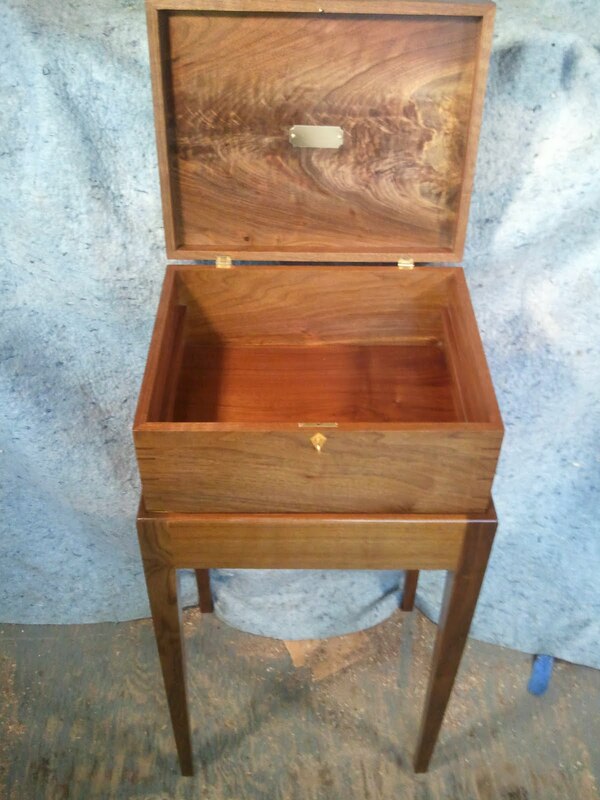 The next two photos show the hinged lid closed and then open. These next few photos show the installation of the lock on the box and the inlaying of the Maple escutcheon. 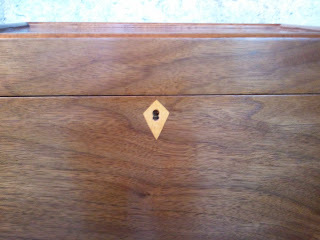 Once the lock was installed I located where the escutcheon should be and glued it in place. 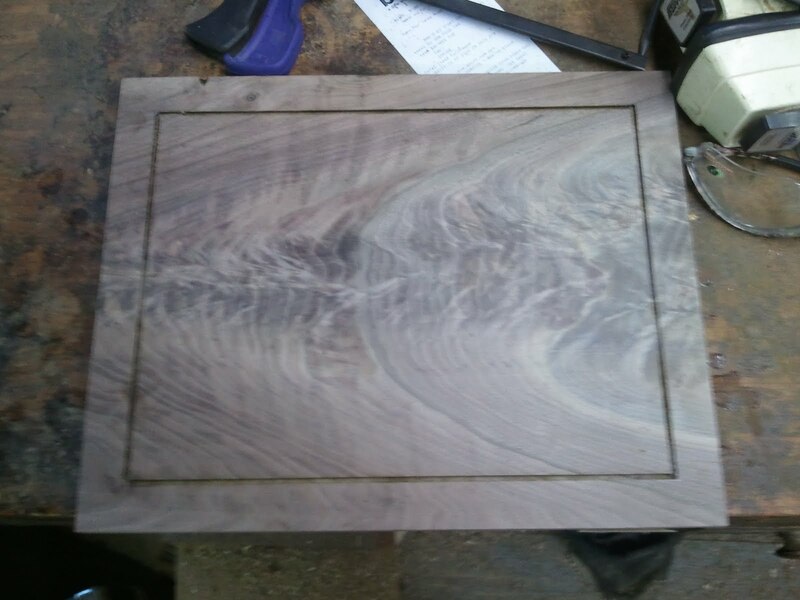 A similar process was used to inlay the brass plate on the inside of the lid. This can be seen in the third photo down. One piece I left out of the Sketchup design was the tray. The customer wanted nine compartments with removable sides. 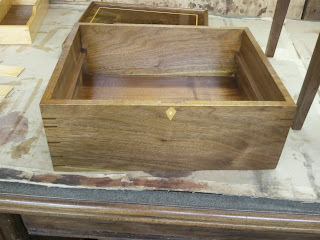 The tray was also to have integral handles that allowed it to be removed and the bottom area to be accessed. 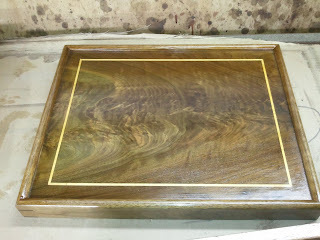 The tray was also to be made of Maple with a Walnut bottom. 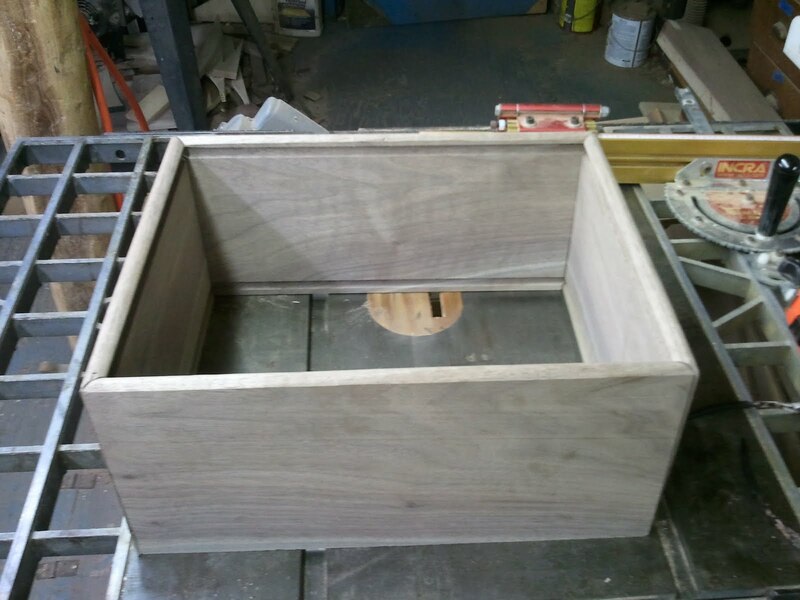 The photo below shows the resulting tray fitted into the box. 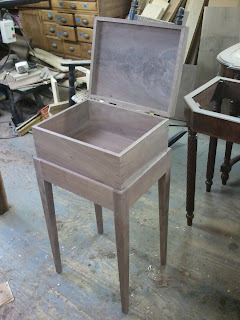 These next two photos show the sanded box completed and ready for finishing. 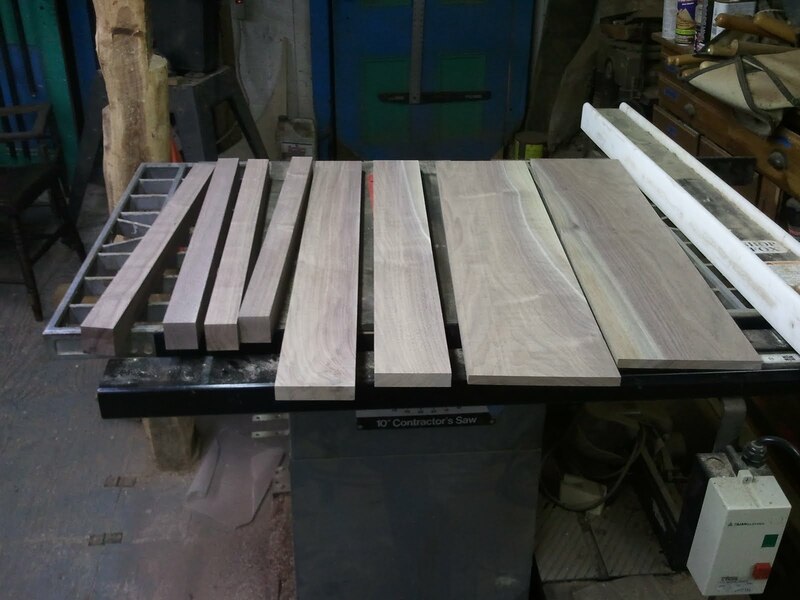 The next three photos show the pieces all laid out during the finishing process. The following photos show the completed jewelry box from different perspectives and with the lid open and the tray removed and inserted. This was a great building project and a great way to finish out 2011. 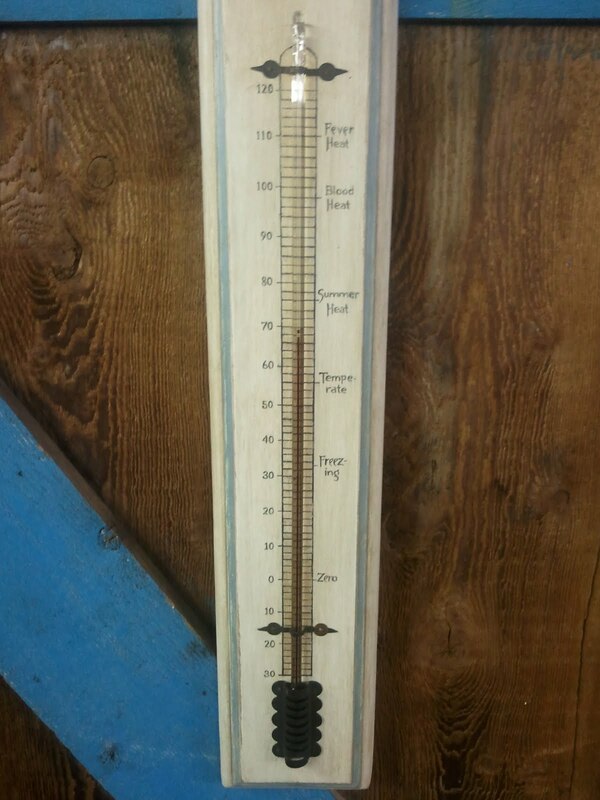 One piece I worked on recently that was unusual was an outdoor thermometer with a painted wooden back. 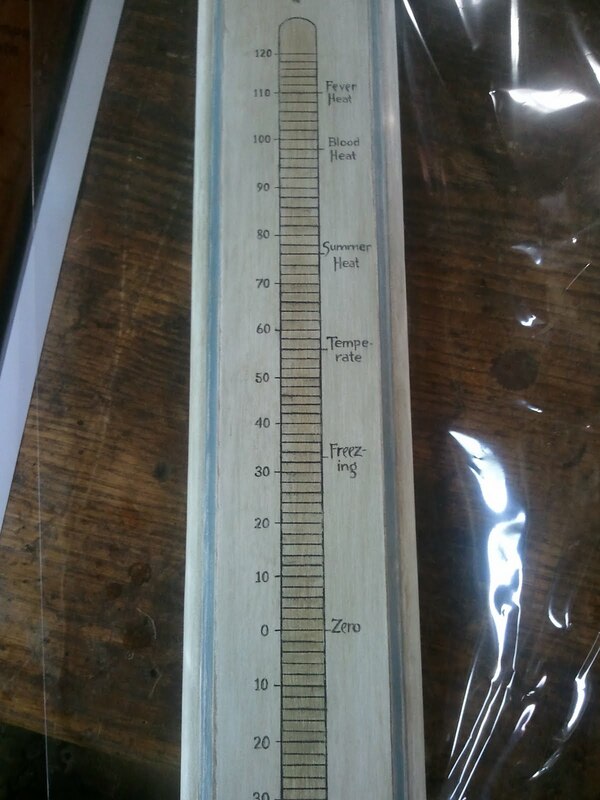 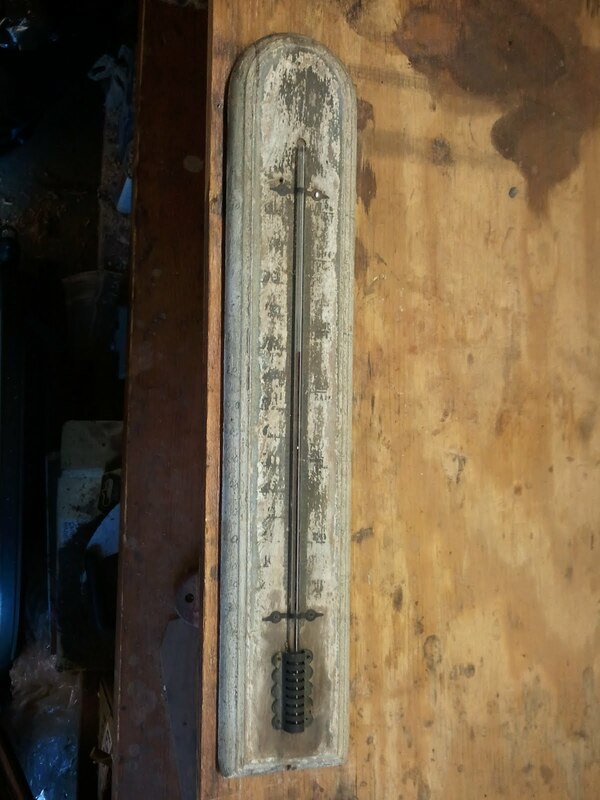 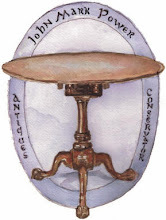 When I received the thermometer from the customer, the wood back and the thermometer glass were in great shape but the paint had deteriorated to the point where the thermometer could barely be used. 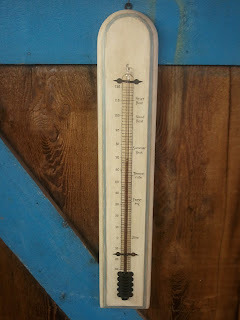 At some point in it's life someone wrote the indications on the side of the thermometer so that it could continue to be used, but even these had faded. 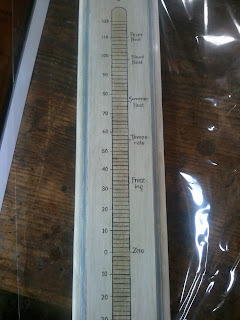 The customer, who had owned the thermometer his entire life, remembered words written on the right side of the thermometer and one that could be clearly read was the word "blood". 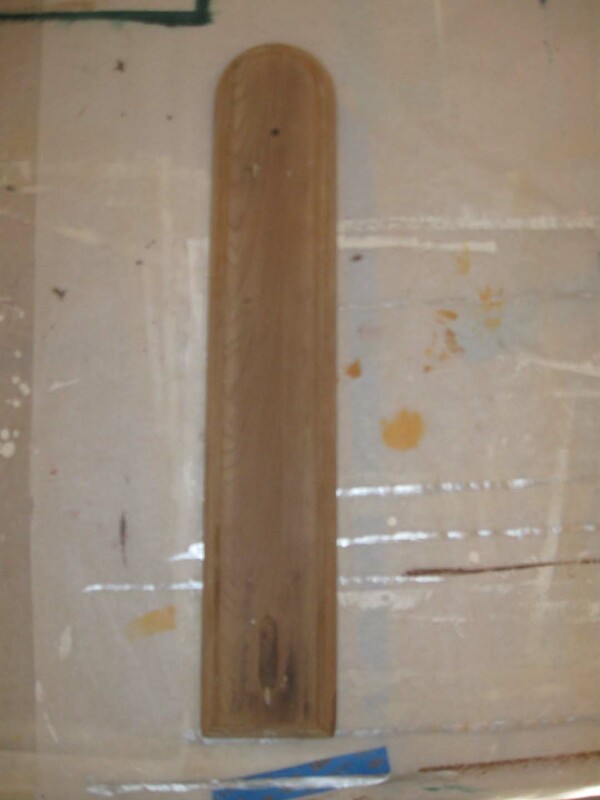 That was about it. 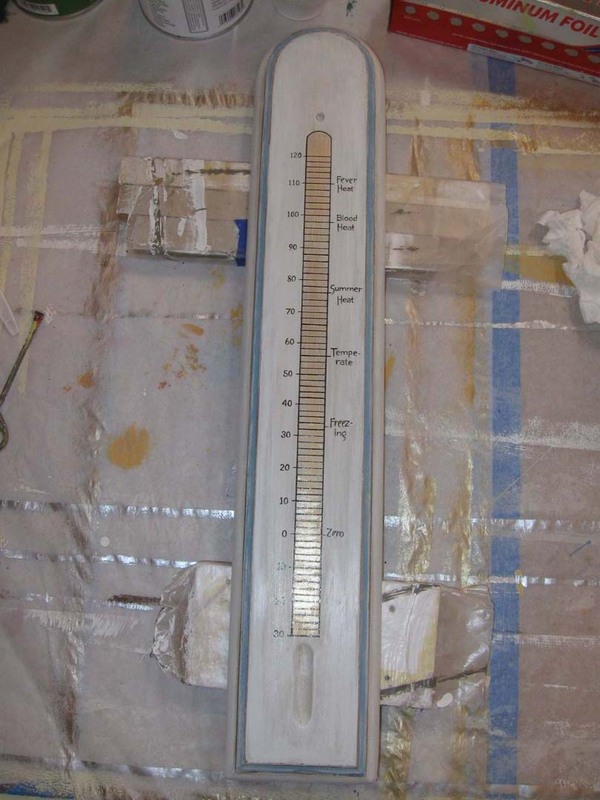 What I was hired to do was to have the face repainted with the proper indications and if possible the words that had been lost. A real challenge! 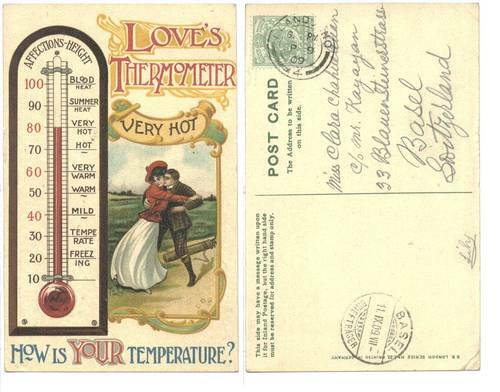 I was able to blow up this image to get a look at the font and the terms and all of the indications were the same as the one I needed to restore, with the exception of the highest temperature reading. 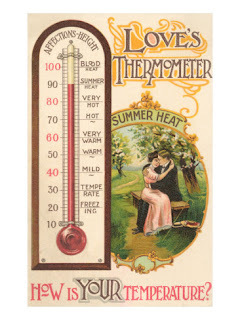 A little more digging revealed that this said "Fever Heat" at a staggering 110 degrees. Quite a fever. 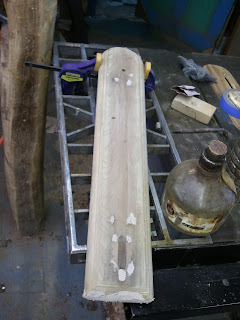 Now I had all of the markings that I needed to get started. 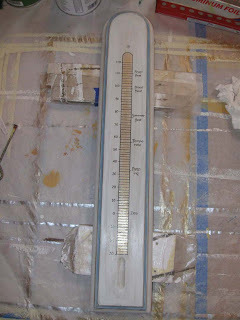 Before Roberta could paint the thermometer back I needed to prep it for her by removing the original paint and repairing the damage. 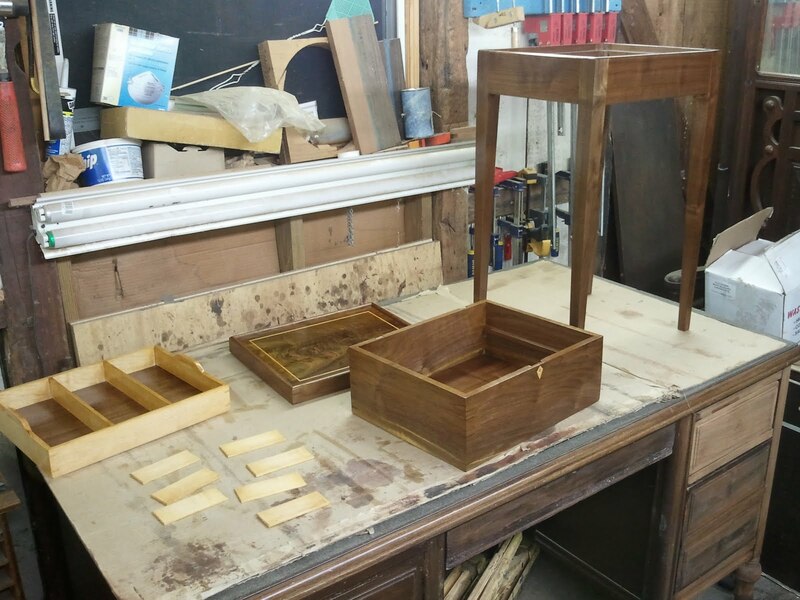 Below are photos of the process of the restoration from start to finish. 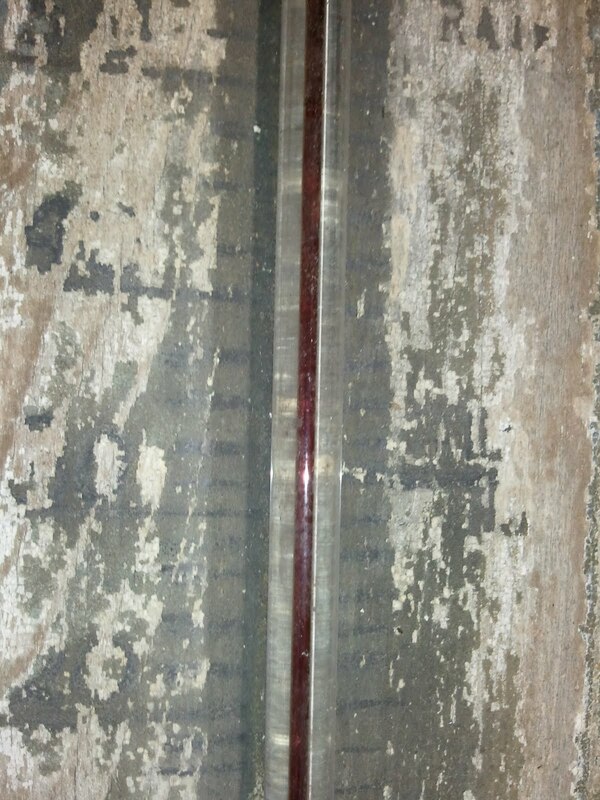 This first image shows the thermometer in the condition that I received it. 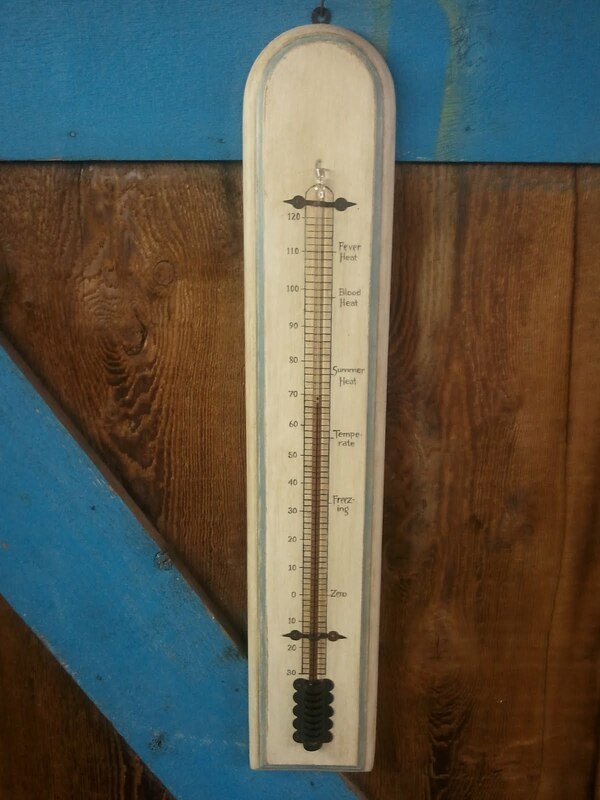 This detail shot shows the numbers written in on the side of the thermometer. 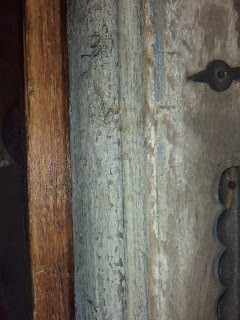 It also shows the remnants of a blue paint around the molded edge. This photo shows the indication marks that were still visible. 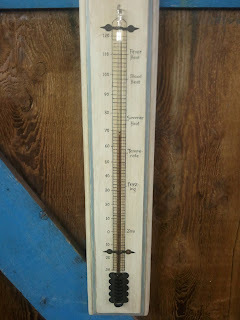 These were transferred to ensure that the thermometer would give an accurate reading! Here is a shot of the back without the thermometer in place. 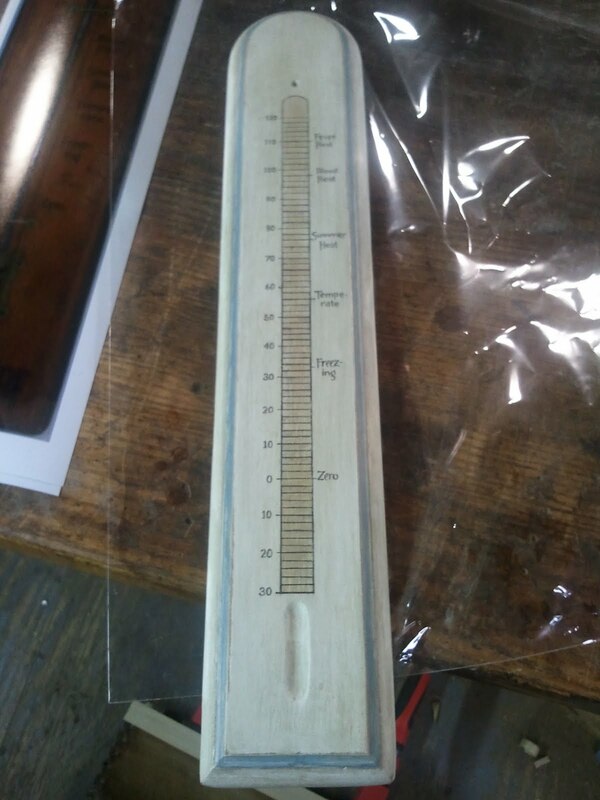 While removing the finish, I found that the backing behind the thermometer had a gold paint behind it, which we decided to copy. 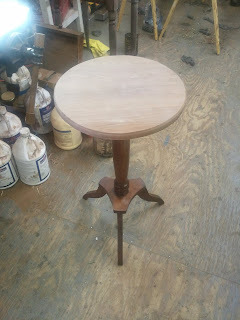 After that I removed the finish and repaired the back. Here is a photo of the back being repaired. 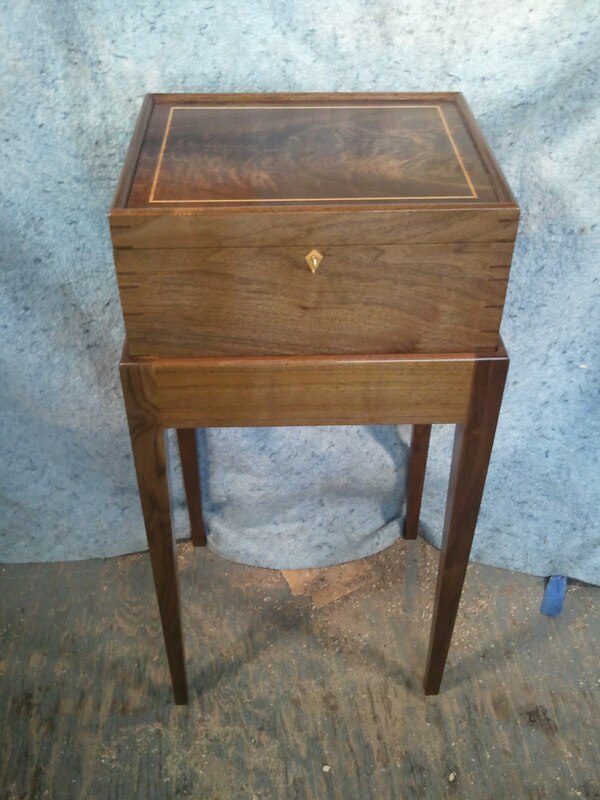 The repaired back was given over to Roberta. Here is a photo of the back when it got to her shop. Here is the back during the painting process. These images show the back painted. 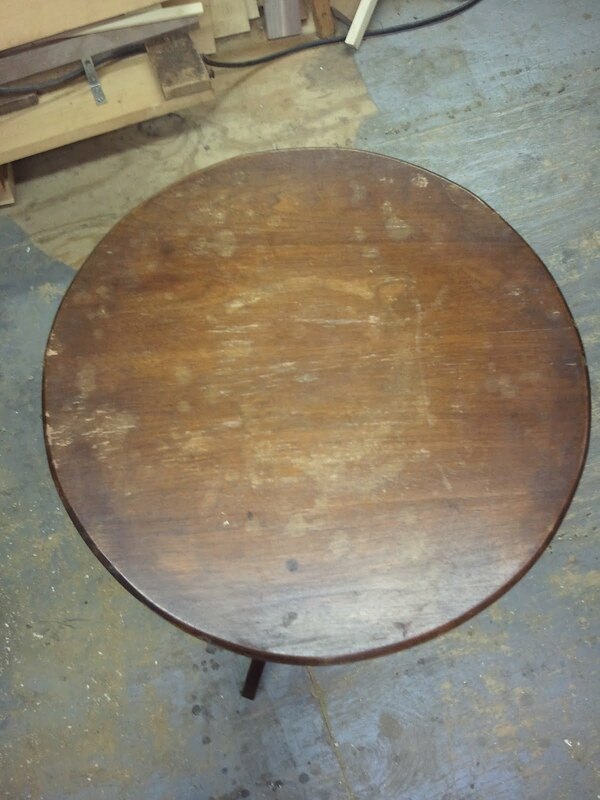 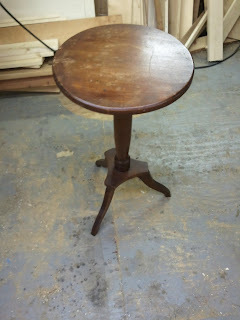 after the indications and words were put in place, the paint was distressed and "dirtied" to give an older appearance. 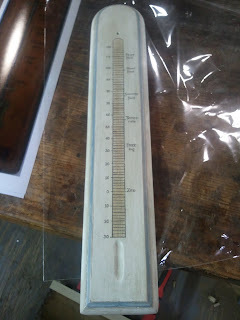 These last two photos show the thermometer assembled and ready for delivery. 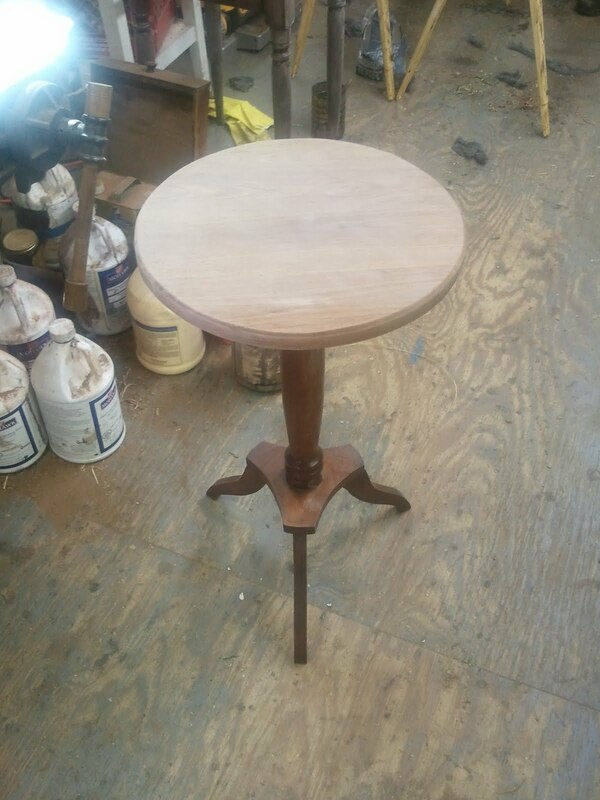 All of the indications were in place and reading properly. This was a great project and I could not have done it without the talented hand of Roberta Marovelli. 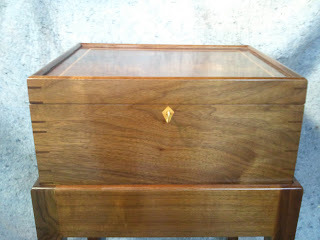 Thanks to her for a fine job!